Duchess, like Peddler before it, is a card you almost never want at full price. Since the deck-inspection feature is enjoyed by all players--none of whom had to play Duchess, except you--the card’s sole net benefit is + $2. This means that although Duchess is cheaper, it is strictly worse than every other terminal silver card. Fortune Teller, for example, also attacks your opponents. Chancellor can grant you a fortuitous reshuffle. Both of these cards are terrible. That’s not a great sign for the Duchess. And yet, Duchess is considerably underrated, since you can gain it for free whenever you gain a Duchy. This is (usually) a great deal, and can ease the decline of a once-great deck choking on green. Typically, you're reaching for Provinces (or Colonies) and only dip into Duchy territory when you need green at all costs, toward the end of the game. But once you do, take the Duchess. Your odds of colliding it with a better Action are much lower once you’re greening heavily. There are exceptions of course: Terminal Draw Big Money (where the Duchess is just another dead card standing between you and your Treasures), and Golem decks (where Duchess isn’t an Action you want Golem to find), among them. Occasionally, Duchess serves as an appealing opening on a 5/2 split. $5 Actions like Laboratory, Stables, Governor, Apprentice and Hunting Party are just begging to be paired with an early source of money, and Duchess's $2 for $2 is the best bang for your buck if you find yourself opening 5/2. But Duchess’s moment in the sun really comes in situations where Duchies are part of the plan, rather than just consolation prizes. Such decks most commonly include alt-VP cards like Duke, Gardens, Silk Road, and Vineyard. Duchess’s synergy with Duke is fairly obvious: You get to add terminal sources of money to your deck as it takes on Duchies. A bloated Duchy-Duke deck is happy to have more sources of money thrown in, and +$2 is all you need when your target price is $5. As a plus, the deck inspection helps you a bit more than your non-mirroring opponent, since you will have more junk to discard. Silk Road and Gardens strategies often dip into Duchies to score cheap points, boost the value of SRs, and empty a third pile. And since you can drain the Duchy and Duchess piles at the same time, the 3-pile ending--an important thing for alt-VP decks--gets even easier. That’s an important general point about Duchess, actually; any game where your strategy hinges on pile-driving--going for Duchies instead of Provinces in a no-trashing Sea Hag game, for instance--is aided by Duchess. Duchess can even play a role in Vineyard strategies. Vineyard always loves cheap Action cards, but Duchess solves the typical late-game Vineyard “actions or points?” dilemma by providing you a way to pick up 3-points and an extra Action card without needing $7 or +buy. Duchess even gives a boost to the oft-overlooked Transmute. It’s well known that if you want Duchies, burning off valuable Action cards with Transmute isn’t a great way to get them. But with Duchess, you can create a self-sustaining loop for it. Just Transmute Duchess into Duchy, gain Duchess, and repeat. This may not be the most game-warping strategy out there, but it’s certainly less demoralizing than transmuting Hunting Parties into Duchies. It’s true, nobody will ever sing songs about the Duchess, or celebrate her awesomeness in articles titled “Duchess: Better Than Wharf?” or “Step Aside, Chapel, She Has Arrived.” But even on-gain, Spy-variant, Duchy-accomplices can shine from time to time. Edit 1: Added 5/2 opening considerations. Good article on an infuriatingly underappreciated card. Why not Venture? Thanks! Just because Venture can't activate Duchess, since Duchess isn't Treasure. Although I suppose since Venture isn't really hurt as much by the addition of green, you can afford to take on Duchies, and I guess Duchess doesn't exactly get in the way. Maybe I should strike that one from the list. Here's where axlemn and I learned just how powerful Duchess + Duke is. That's actually like a perfect example. After the game we both just sat there and were like, "Wow, what just happened?" Notice I buy Duchy on turns 3 and 4. Somewhat lucky, but not that lucky with Silver/Silver opening. Great article, thanks ! I think duchess is underrated too, but it's difficult to understand this card perfectly. Fortune Teller, for example, also attacks your opponents. Chancellor can grant you a fortuitous reshuffle. Both of these cards are terrible. It's also good in some 5/2 where you desperately need the +$2 ASAP. Also duchess can dump a top-deck copper (on the flip side, if your opponent has lots of ventures, this may be a reason not to gain her). You mean Mint right ? I don't see other examples. 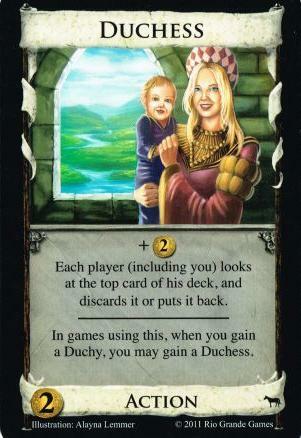 Is Duchess the 2 cost card that is least likely to be bought for 3 or more coins? Probably, but that's because Duchess is better gained then bought. I actually don't think it changes the card much to move the price. This is card you gain, rather than buy, 95% of the time. The fact that it costs $2, really, is just something nice on the 5/2 opening if you want to to pair a Lab/Stables/Hunting Party opening with a terminal silver. I should have mentioned that. It's great as an opening with non-terminal $5s. I open it with terminal 5's. I don't see what's wrong with that. There's a 28~% chance it makes 1$ less than copper and a 72ish chance it makes 1$ more on turns 3/4. Where's the bad? Robz love for the Duchess is why we've had so many mafia games, he just keeps loving the duchess and when she loves another man well there's hell to pay! The fact that it's another terminal you may not want in your deck in the long haul. In your opening, you have to consider more than just one time through the deck. There are two things people always overlook with duchess: you can get it for free and it is the cheapest reliable source of coin/price. The first you have mostly dealt with, I'll just add in another that can sometimes be useful - TfB. Yeah, a lot of TfB don't like duchies, but if you are late enough in the game that you are hitting duchies anyways, then stuff like trade route, apprentice, expand, etc. can sometimes make good use of the free 2 coin card that you absolutely don't care if it ends in the trash; even something like remodel can turn duchess into a late game island (or mining village) if the setup supports it. E.g. if you are playing a heavy expand game like Tr/Exp/Cartographer - if you have to grab a duchy the duchess can be expanded into another duchy - duchess is particularly useful if you are behind and need a few double duchy turns to have a chance to win. The second a lot of folks miss because we are heavily trained to think that pretty much all cards costing less than 5 coin are in the same price pot. This is often true when you have one buy and you don't want too many actions (e.g. virtually every BM deck). However, this is not always the case. A 5/2 opening is one scenario where the gap between the 2 coin duchess and the 3 coin chancellor makes duchess the better card for you (because you can actually buy it). Likewise, engine building really likes cheap spam cards that fill a niche. For instance, let's say you are building an engine with lab, Kc (none yet), loan, and margrave. You hit 9 coin, 2 buys. Now duchess really shines - you need the cash and you can actually buy it THIS turn with the Kc. Some engine setups have lots of spare actions (e.g. Kc, Tr, festival, etc. engines) and most engines have spare buys during the building phase. Duchess can help you convert those actions to cash and do so without having to forgo some other part of the engine. Yeah in BM, even with 2 buys, you are rarely going to say well great I can get this 5 AND a duchess instead of a gold; however in engines that gold is not always all that useful (e.g. limited draw engines) and you may really need a key 5 (e.g. minion, lab, etc.) more than the gold. Another engine shot is when you simply need action-coin. Menage/hamlet can get built up into some crazy engine, but unless you have action-silver it is fairly hard to get to megaturns. If duchess is the only action-coin on the board, then hey it still is an action-silver. Something like menage/chap/hamlet/ghost ship/duchess would make for a strong engine when BM is going to be slow and where you don't have another option for your payout. Like all action-silvers, duchess can work better with library, watchtower, menage, jack, Tr, Kc, etc. than simple silver and you should not those engine options if duchess is the only card there to make it happen. Duchess also can help you balance the three main components of an engine: draw, actions and payout by allowing you to buy what you need in terms of draw/actions so you can go for menage/duchess instead of festival this turn if you are getting too low on draw but have an abundance of actions. Or conversely if you have enough council rooms and discard attacks, but need +actions and +coin, then you can opt for village/duchess to keep your engine balanced. In an nutshell, engines often want to gain two or more cards (and often two or more functions) a turn. Duchess, by dint of being dirt cheap, fits in a LOT easier as a second buy than just about anything else. There is a world of difference between 2 and 3 coin when you are sitting on 7 coin and 2 buys when engine building. Maybe I'm a heretic here, but I think the primary usage of Duchess is what Robz buried in the 6th paragraph: It empties a second supply pile. This can make a big difference in a Duchy Rush (or other 3-pile strat) being viable. In fact, I would go so far as to say Duchess turns Duchy into an alt-VP strategy like Gardens. It doesn't enable a Duchy rush all on its own, but it makes it feasible with only one other decent support card. Time for some hand-wavy BS maths: There are two parts to a Duchy rush, the Duchy and the Rush. The Rush meaning, being able to 3-pile before your opponent has 4 provinces. Normally this meanings getting 28 cards out of the supply, in like 15 turns or so (remember, Duchy pile is 8, not 10). With Duchess around, you only need to get 20 cards out. That's more than a 25% decrease! If your opponent is buying a few cards from the 3rd pile you're hammering, then it's more like going from, say, 24 to 16--a 33% decrease! And somehow gaining 16ish cards in 15ish turns sounds a lot more feasible than somehow gaining 24ish cards. To be fair, silvers and coppers don't count, so it's basically 20 kingdom cards, not any 20 cards, and 8 of them cost $5. And you still need some sort of support to pull it off (like Horse Traders). But my point is: Duchess puts a Duchy Rush on the map, whereas before it was pretty much an inconceivable strategy. duchess + hunting party is actually a bad idea because of the reshuffle problem. I don't think that makes it a really bad idea. Hunting Party wants a terminal silver, and especially on a 5/2, Duchess is just fine for that. I'm sure a 5/2 Hunting Party/Duchess start would beat a similar start without Duchess. And if there weren't any other terminal silver cards, I would also expect the Hunting Party deck with Duchess to beat the one without.